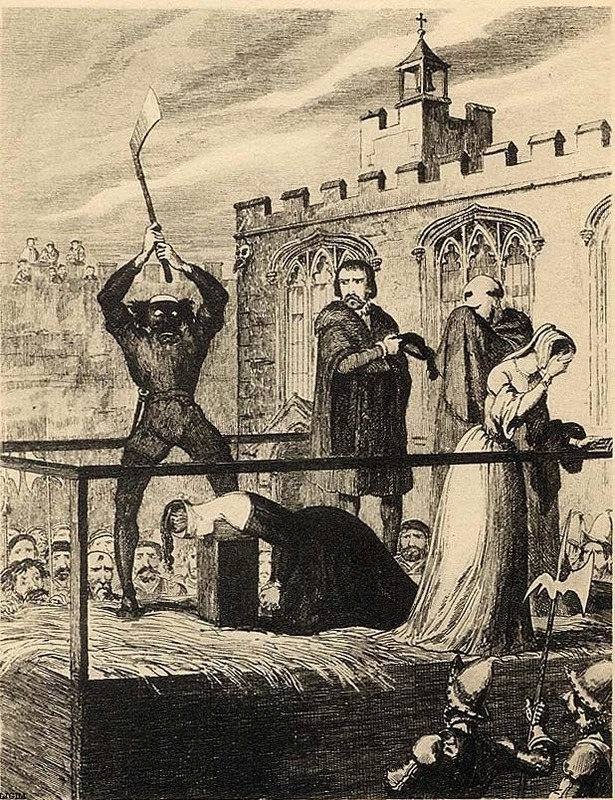 On this day in history, 13th February 1542, Queen Catherine Howard, the fifth wife of Henry VIII, was executed at the Tower of London. Her crime? She was found guilty of having committed adultery with Thomas Culpeper and hiding her colourful past from the king. This meant that, even if Catherine, like she swore, had never cheated on the King, her sullied reputation would be enough to cast doubts on the paternity of any future royal children. Therefore, she was a traitor and, as such, she was condemned to death. Lady Rochford, George Boleyn’s widow, found guilty of helping the two lovers, was condemned to die on the same day too. “From Calleis I have harde nothing as yet of your sute to my Lord Gray: and for news from hens, know ye, that even according to my writing on Sonday last, I se the Quene and the Lady Retcheford suffer within the Tower, the day following, whos sowles (I doubt not) be with God, for thay made the moost godly and christyan’s end, that ever was hard tell of (I thinke) sins the worlds creation ; uttering thayer lively faeth in the blode of Christe onely, and with goodly words and stedfast countenances thay desyred all christen people to take regard unto thayer worthy and just punnishment with death for thayer offences, and agenst God hainously from thayer youth upward, in breaking all his commandements, and also agenst the King’s royall Majesty very daungeriously: wherfor thay being justly condempned (as thay sayed) by the Lawes of the Realme and Parlement, to dye, required the people (I say) to take example at them, for amendement of thayer ungodly lyves, and gladdly to obey the King in all things, for whos preservation thay did hartely pray; and willed all people so to do: commending thayer sowles to God, and emestly calling for marcy upon him: whom I besieche to geve us grace, with suche faeth, hope, and charite at our departing owt of this miserable world, to come to the fruytion of his god-hed in joy everlasting. Amen. Catherine never uttered the words “I die a Queen, but I would rather die the wife of Culpeper”. Instead, after living a reckless life, she died with dignity.